A vibrant yellow color palate and bilingual store signs emphasize the Caribbean vibe at the newest Fresco y Más store. Southeastern Grocers Inc. has made expansion of its Fresco y Más stores a growth focus, and the Latino banner now aims to broaden the customer base with its latest store. The new Fresco y Más due to open on Dec. 5, in Lauderhill, Fla., will be the chain’s 26th location and its first to emphasize products for Caribbean customers, Southeastern Grocers said Monday. Along with traditional Hispanic offerings, the Lauderhill store will serve up a wider array of items catering to Caribbean tastes, such as more fresh seafood; islander produce and specialty meat cuts; an extensive selection of Caribbean seasonings, spices, snacks and beverages; and a hot food section with popular Caribbean foods. The new store’s produce area will offer an expanded assortment of local fruits and vegetables tailored to Hispanic and Caribbean shoppers, while the full-service Latino “Carniceria” (butcher shop) provides custom-cut meat, including goat and oxtail. Among the Lauderhill store’s fresh departments, the produce area will offer an expanded assortment of local fruits and vegetables tailored to Hispanic and Caribbean shoppers, including jackfruit and root veggies, in a farmers’ market setting. A new, full-service Latino “Carniceria” (butcher shop) will provide custom-cut meat — including Caribbean favorites such as goat and oxtail — while the seafood counter will feature an added assortment of crab and whole fish. The bakery department will serve a variety of Hispanic, Caribbean and local baked goods, including flan and custom tres leches cakes, all made fresh daily. And an “International” aisle will stock more than 1,200 products, including Caribbean items, organized by country of origin, Southeastern Grocers said. 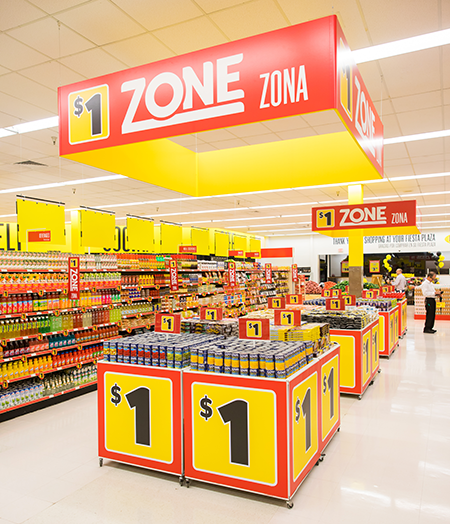 The Fresco y Más Dollar Zone section features more than 1,000 daily staple items for just $1 each. Prepared foods will be a focus as well. A new café with expanded seating will serve authentic Caribbean and Hispanic breakfast items, such as croquettes, Jamaican patties, pastries, drinks, and hot and cold sandwiches. Daily specials of freshly made family favorites — including jerk chicken, goat stew and Caribbean rice — will also be offered in an updated “Cocina” (kitchen) area. Other new features at the Lauderhill Fresco y Más store include custom façade signage, a vibrant yellow color palate and bilingual store signs; a Wall of Value section providing weekly specials on items customers purchase most; and a Dollar Zone section with more than 1,000 daily staple items for just $1, with offerings ranging from grocery to household cleaning to health and beauty. Hucker and Lauderhill Mayor Ken Thurston are slated to participate at a grand opening event for the new store on Wednesday. The first 500 customers will receive a free mystery gift card valued at $5 to $500, as well as a Fuel Rewards code to redeem and save 25 cents on their next fill-up at participating Shell gas stations. Shoppers also will be able to sample Hispanic and Caribbean cuisine and enjoy live entertainment. Fresco y Más serves Hispanic communities in South and Central Florida. After a quick emergence from Chapter 11 bankruptcy protection at the end of May, Southeastern Grocers said it aims to complete 100 remodels across its store banners — which also include Winn-Dixie, Bi-Lo and Harveys — by the end of this year. The Jacksonville, Fla.-based company operates about 575 stores in Alabama, Florida, Georgia, Louisiana, Mississippi, North Carolina and South Carolina.